The death of Cardinal Paulo Evaristo Arns at the age of 95 today leads to an interesting change in the College of Cardinals, albeit a ceremonial one with virtually no effect of the day-to-day affairs of that body. Cardinal Arns was created a cardinal by Blessed Pope Paul VI in 1973. His death leaves only one surviving cardinal, albeit a former cardinal, created by that Pope. He is the Pope emeritus, Benedict XVI, created in the four-man consistory of 1977 (the blessed pope’s last one). Cardinal Arns was also the most senior of the Cardinal-Priests, one of three classes of cardinals. This gave him the office of protopriest, which entailed certain duties following the election of a new Pope. The protopriest pronounces the formal prayer for the new Pope after the protodeacon has bestowed the pallium and before the Dean of the College of Cardinals presents the Ring of the Fisherman. That said, Cardinal Arns never exercised that duty as he was not present at the inauguration of Pope Francis, and Cardinal Danneels acted in his stead. The new protopriest is Cardinal Michael Michai Kitbunchu, 87, retired archbishop of Bangkok and created in Pope Saint John Paul II’s second consistory in 1983 (the same consistory in which Cardinals Danneels and Meisner were created. Cardinal Kitbunchu is protopriest only because his name came before theirs on the official list). Cardinal Paulo Evarista Arns was auxiliary bishop of São Paulo in Brazil from 1966 to 1970, and archbishop of that same see from 1970 to 1998. As cardinal he held the title church of Sant’Antonio da Padova in Via Tuscolana. He had been protopriest since 2012, the third Brazilian in that role after Cardinals Sales (2009-2012) and De Vasconcelos Motta (1977-1982). Cardinal Arns had been in hospital since the end of November for pneumonia. An obituary for the ‘cardinal of the people’ may be read here. In a book recently published, which, like a number of earlier publications, takes the form of a conversation with a (not necessarily) religious philosopher, Archbishop André-Joseph Léonard comments on his thoughts at never being made a cardinal. In the past he has stated that it was no concern to him, not least as Pope Francis preferred to create cardinals from the peripheries of world and Church. Now that he has made Archbishop’s Léonard’s successor, Archbishop Jozef De Kesel, a cardinal, the comments can be seen in a new light. Later in the conversation, he speaks some more about his personal feelings. Following the appointment of future Cardinal De Kesel, it is clear that Archbishop Léonard’s assumption that Pope Francis does not want to create cardinals simply because it goes with the see they’re in is not correct. That said, it is equally clear that Pope Francis chooses cardinals who fit a certain pastoral mold, and if these happen to be in traditionally cardinalatial sees, so be it. De Kesel in Mechelen-Brussels is one example, Osoro Sierra in Madrid and Cupich in Chicago are others. While Archbishop Léonard would never express any doubts or questions he may have at the choice of Archbishop De Kesel for the red hat, others have. In more than a few places, it has been seen as a slighting of Archbishop Léonard, who is now the first archbishop of Mechelen-Brussels since 1832 to not be made a cardinal. While a cardinal’s hat should not be seen as a reward (except in those cases where it given to a retired priest or bishop well in his 80s or 90s), the question remains why Archbishop Léonard never received one. It is not because Mechelen-Brussels no longer has the status in the Church it has (although that status has obviously changed as the heartland of the Church shifts way from Europe). It is also not because, as some have said, Cardinal Godfried Danneels, Archbishop Léonard’s predecessor, had not yet reached the age of 80. Danneels turned 80 in 2013, more than two years before the retirement of Archbishop Léonard. Is it then because Archbishop Léonard did not meet the criteria of Pope Francis for the red hat? In a recent piece on Cardinal-designate John Ribat of Port Moresby, John Allen Jr. outlines the three criteria that the Pope seems to follow for making cardinals: being from the periphery, supporting a cause near to the Pope’s heart, and being his kind of guy. Archbishop Léonard does not tick the first box, but then again, neither does Archbishop De Kesel. 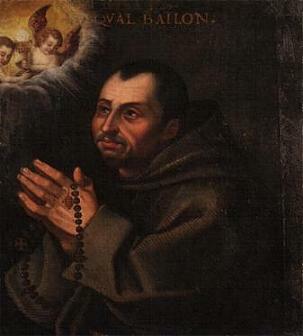 If a cause can be attributed to Archbishop Léonard, it is evangelisation. Hard to go wrong there, although the ways of achieving it are varied, and Archbishop Léonard’s way of evangelisation through catechesis may not be that of Pope Francis, who has a more hands-on approach. And as for being the Pope’s kind of guy, that is hard to estimate. Archbishop Léonard was certainly not afraid to be among the people. From the very start of his time in Brussels, he went out to visit the deaneries of his archdioceses in cycles that he would simply repeat once completed. The smell of the sheep was not alien to him. Still, discussing why one man is made a cardinal and the other is not is, to a large extent, a guessing game, and there will probably always be more suitable men than there are red hats to give out. That said, it is my opinion that Archbishop Léonard would have been a fine choice for cardinal. Whether Archbishop De Kesel will be, that remains to be seen. In his short time in Brussels he has said and done both positive and negative things (his defense of a hospital’s freedom to deny euthanasia comes to mind, but so does his strange decision to disband the Fraternity of the Holy Apostles). Read my translation of the homily, which was given in both French and Dutch, below. The Scripture readings we have just heard are the reading for the third Sunday of Advent. They are words that are being read today and tomorrow everywhere in the world, wherever Christians come together on the Sunday. They prepare us for Christmas. But they do give us mixed feelings. On the one hand we have John’s call for conversion. That we do not miss He who is coming. For He is coming, he says, “to clear his threshing floor”. Not exactly a comforting message. Words that point out the seriousness of the situation and our responsibility. But at the same time there is also the call to joy. “Rejoice in the Lord always. I shall say it again: rejoice!” he says. Of old this Sunday has also been called this: Sunday Gaudete! And Saint Paul adds, “Have no anxiety … the peace of God that surpasses all understanding will guard your hearts and minds. The Prophet Zephaniah shares the same call for joy. They seem unlikely bedfellows: the seriousness and responsibility that John emphasises and the call to joy and happiness. But it is these two which brings us together today: great responsibility, but also great joy. Yes, the words of John are binding. He calls to conversion. Yet when those who have just been baptised ask him, “What should we do?”, his response is surprising. He asks for nothing extraordinary or sensational. Share what you have. They should not give everything, but what they have. If you have more clothing than you need, then give to those who do not have enough. The same applies to food: share what you have more of than you need. And to the tax collectors he does not say to cease their work. He simply says, “Stop collecting more than what is prescribed”. Beware of corruption. And the soldiers who come to him, he does not ask to desert. He simply asks them: do what you do properly, without abusing your position and without the use of arbitrary violence. Never forget that you are human like everyone else. What John asks requires string commitment. That is true. But he does not ask anything extravagant. A baptised person does not keep a distance from others. We are to return to the responsibility and solidarity that we share with all men, regardless of their religion of belief. But why be baptised? Why be Christian? The liturgy of this Sunday gives us the answer, and it too is astonishing. It is the joy that makes me a believer. It is not out of necessity or because I feel obligated. I am a Christian in freedom and love. We are known and loved by God. This is the heart of our faith. This joy and all love is therefore a call to fidelity and conversion. This is the heart of Christianity. Not in the first place a doctrine or morality. But the certainty that we, frail and temporary people, are known and loved by God. It can hardly be imagined. But how, if this is true, can we not rejoice? Of course this does not answer all questions or solve every problem. But we know from experience how much this makes us happy, gives meaning and direction to our existence: that we are known, appreciated and loved by other people. That we are not nobody. Exactly that is the joy of the Gospel: to know that we are not only by those who are near to use, but by God Himself, the Creator and source of all that exists. Known and loved and radically accepted. Not without reason did Pope Francis call his first Exhortation “The Joy of the Gospel”. And not without reason did he, last Tuesday in Saint Peter’s Basilica in Rome, at the start of the great jubilee, open the door, the door of God’s mercy. Like we will do tomorrow here, and in Brussels and in Nivelles and in all cathedrals and jubilee churches in the entire world. No, God is not an indifferent God. No arbitrary power, only concerned with Himself. We people are worth everything to Him. That is why He ask that one thing: that we are also not indifferent to each other. Especially not to those who stand at the side and do not matter, the poor and vulnerable, and the countless who are fleeing from war and violence. That we respect all life, no matter how small and vulnerable. Respect for the religious and philosophical convictions of every man. Respect and care for the planet we inhabit. We are also responsible for future generations. This world can be a hard place. This is what the Gospel asks from us: that we do not became hard and indifferent, insensitive and merciless. Because that is our greatest danger today: the globalisation of indifference. This is the Gospel that the Church proclaims. The Gospel of God’s tenderness. And this is not just rhetoric. He is committed to the very end. And His Son, Jesus Christ, became one of us, vulnerable and defenseless as a child of men. A miracle of humanity. A love to which there is only one answer: to love in our turn. We appreciate and respect each other. Proclaiming the mercy of God and calling for respect and love, that is the mission of the Church. This is the place it searches out in our pluralistic and modern society. Nothing more, and nothing less. In a secularised culture, she can and must make her voice heard. And so much more than a religious fundamentalism that at this time constitutes a very real threat. This is the vocation that the Church has received from God. To that we want to dedicate our best forces at the task entrusted to me today. I with you, and you with me. As we heard from John: no extravagant or spectacular projects. But a search for a consistent experience of the Gospel. And with that one certainty: that we are known and loved by God. That is our joy and faith today. On Sunday, the first Sunday of Advent, Archbishop André-Joseph Léonard bade his first of four farewells to the archdiocese he led for six years. He did so as Mechelen’s cathedral of St. Rumbold, for the vicariate of Mechelen and Flemish Brabant, in the presence of priests, faithful, auxiliary Bishop Léon Lemmens and his predecessor, Cardinal Godfried Danneels. In his homily, the translation of which follows below, the archbishop looked back on the past years and his own efforts in shepherding the faithful of Mechelen-Brussels “towards the heart of our faith, the person of Jesus Christ Himself”. I am very happy to be able to say goodbye to you on this first Sunday of Advent. For, as you may perhaps know, I took my episcopal motto from the prayer at the heart of this liturgical time: “Yes, come Lord Jesus!”. Of course, the second coming of Jesus in glory will be preceded by terrible tests; a bit like everyone’s arrival into eternal life will be preceded by the narrow passage of our death. That is why we do not give in to fear, but recover and rise again, for our salvation is at hand. In the six years that I was bishop among you, I tried to lead you to the heart of our faith, namely the person of Jesus Himself, true man and true God, crucified to bear all our pain and resurrected so that we down here could already have a taste of a life which continues past death. I have tried to raise you up “on high”, to the Lord, true my teaching and especially through the celebration of the liturgy in a way worthy of the Lord and which could teach our hearts most deeply. That is why I wanted to meet you all in the field, in the 15 deaneries of our vicariate of Flemish Brabant and Mechelen. I was touched by the warm welcome that I received everywhere and by the wealth of what is happening in numerous parishes. For that I thank you from my heart. At this time you are working hard on the restructuring of the parishes. That operation is necessary, but sometimes also a but painful or disconcerting, as, by the way, is the case with every ‘operation’. But this restructuring is only a means. As my successor has said at the press conference for his appointment: the essence lies elsewhere, the essence is the blazing flame of love, the spiritual, yes, even prophetic elan which must inspire the structures. This inspiration can only be received as a grace, through prayer and adoration, because it is a gift of the Holy Spirit. When I met you during my pastoral visits, I was full of admiration for the engagement of so many lay people, so many consecrated persons, and a great number of very well-formed deacons. But you will understand that I will express my special gratitude, first and foremost to my auxiliary bishop, Msgr. Lemmens, and his coworkers, on whom I could count, and finally to all my brother priests. I was very pleased with you engagement, you availability for all people. I when I met brothers who experienced difficulties or about whom I had heard bad words, I tried as best as I could to give them a new chance, by given them my trust, every time anew. 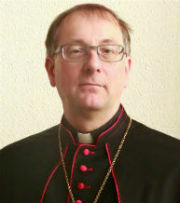 The three other occasions to bid farewell to Archbishop Léonard will be at the cathedral of St. Michael and Gudula in Brussels on 5 December, the national basilica in Koekelberg on the morning of 6 December and the Collégiale Sainte-Gertrude in Nivelles in the afternoon of that same day. Minutes before today’s announcement and presentation of the new archbishop of Mechelen-Brussels, Kerknet had the chance to sit down and ask a few questions to Archbishop-elect Jozef De Kesel. 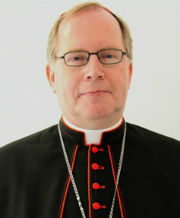 The interview about memories of the past and hopes for the future gives some idea of who Msgr. De Kesel is. At your ordination as priest you were surrounded by priests of the family, and especially also your uncle, Leo De Kesel [auxiliary bishop of Ghent from 1960 to 1991, who ordained his nephew]. Was it a matter of course for you to follow in their footsteps? “In that time we read, for example, Romano Guardini. 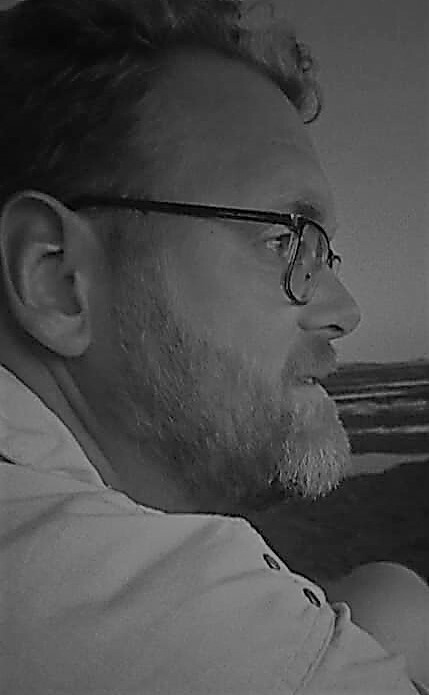 I also followed the movement around Charles de Foucauld. Later, when I studied theology, I read with interest the Jesus book and other literature of Msgr. Schillebeeckx, Karl Rahner and Willem Barnard. “The theologians teach me that the Christian faith is a great treasure with a rich content and tradition. Bonhoeffer teaches me to understand that this tradition can be experienced in different contexts. As bishop you chose the motto “with you I am a Christian” in 2002. What did you mean by that? What are the great challenges for the Church today? “The question is not so much how many priests we need and how to organise ourselves. But: what do we have to say to society? Formation and the introduction into the faith are very important for that. It is not a question of having to take an exam in order to be a part of it. There can be many degrees of belonging. But we can assume that there is a certain question or desire when people come to Church. What sort of Church do you dream of? “A Church that accepts that she is getting smaller. The Church is in a great process of change and that sometimes hurts. But that does not mean that there is decay. There have been times in which the Church was in decay while triumphing. I dream of a Church that radiates a conviction, that radiates the person of Jesus Christ. Of an open Church which is not only occupied with religious questions, but also with social problems such as the refugee crisis. You did not take part in the Synod on the family, but will probably get to work with its proposals. What will stay with you from this Synod? “The Synod may not have brought the concrete results that were hoped for, such as allowing divorced and remarried Catholics to receive Communion. But it is unbelievable how much it was a sign of a Church that has changed. The mentality is really not the same anymore. May we assume that you will take up the thread of Cardinal Danneels? Your predecessor liked to court controversy in the media. Pope Francis stands out for his human style. What is the style we may expect from you? Will you be living in Brussels, like Msgr. Léonard, or will you choose the archbishop’s palace in Mechelen? You like Brussels, don’t you? And Brussels likes you. The Church in Brussels announced this week that Confirmation and First Communion will now be celebrated at the same time, at the age of ten. A renewal you can agree with? The five years in Bruges were not easy. How have they changed you as a man or what did you learn from them?